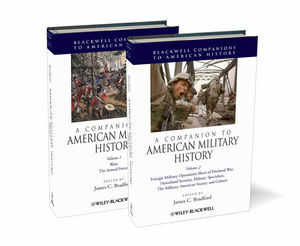 With more than 60 essays, A Companion to American Military History presents a comprehensive analysis of the historiography of United States military history from the colonial era to the present. James C. Bradford is Associate Professor of History at Texas A & M University. He is the editor of nearly a dozen volumes, including the Atlas of American Military History (2003) and The International Encyclopedia of Military History (2006). He is also currently President of the North American Society for Oceanic History. 1. Warfare during the Colonial Era, 1607-1765 (John Greiner). 2. War of American Independence, 1775-1783 (Stephen R Conway). 3. Foreign Wars of the Early Republic, 1798-1816 (Gene Allen Smith). 4. Indian Wars in the East, 1783-1859 (Roger L. Nichols). 5. The Texas War for Independence and War with Mexico (Thomas W. Cutrer). 6. The Civil War, 1861-1865 (Brian Holden Reid). 7. Indian Wars of the Trans-Mississippi West, 1862-1890 (Robert Wooster). 8. The Spanish-American and Philippine Wars, 1898-1902 (Graham A. Cosmas). 9. The United States in the Great War, 1917-1918 (Aaron Anderson and Michael Neiberg). 10. World War II in the Atlantic, North Africa, the Mediterranean, and Europe (Harold R.Winton). 11. World War II in Asia and Pacific (John Wukovits). 12. The Korean War (James I. Matray). 13. The Vietnam War (Ron Milam). 14. The Cold War (Elizabeth Lutes Hillman). 15. The Gulf Wars against Iraq (John R. Ballard). 16. Global War on Terrorism (Hall Gardner). Part II: The Armed Forces. 17. The Continental Army (Charles P. Neimeyer). 18. The Navies and Marines of the American Revolution (Frank C. Mevers). 19. The U.S. Army to 1900 (Samuel J. Watson). 20. The U.S. Army since 1900 (Ronald L. Spiller). 21. The U.S. Navy, 1794-1860: Men, Ships and Governance (Christopher McKee). 22. The U.S. Navy, 1860-1920 (Kurt H. Hackemer). 23. The U.S. Navy since 1920 (David F. Winkler). 24. The U.S. Marine Corps (Jon Hoffman). 25. The U.S. Coast Guard and Its Predecessor Agencies (C. Douglas Kroll). 26. The U.S. Air Force (John W. Huston). 27. The Confederate Army (Arthur W. Bergeron, Jr.). 28. The Confederate Navy and Marine Corps (Mike E. Krivdo). 29. The Citizen Soldier in America: Militia, National Guard and Reserves (James C. Bradford). 30. Defense Unification, Joint Commands, and Joint Operations (Leo Hirrell). 31. Mercenaries, Private Military Contractors, and Non-Traditional Forces (Jonathan Phillips). Part III: Foreign Military Operations Short of Declared War. 32. Forging and Defending a Maritime Empire, 1816-1895 (John H. Schroeder). 33. Interventions in Central America and the Caribbean, 1900-1930 (Anne Cipriano Venson). 34. Military Interventions in Asia, 1899-1927 (Stephen K. Stein). 35. The Occupation of Germany, Austria, Trieste, Japan, Okinawa, and Korea (James Jay Carafano). 36. Military Operations in Latin America, 1961-2001 (Lawrence Yates). 37. Military Interventions Short of War in the Post 1975 Era (James Meernik). 38. Military Alliances and Coalitions (T. Michael Ruddy). 40. Attachés, MAAGs, and MACs (Brian Tyrone Crumley). 41. Early American Insurrections (William Hogeland). 42. The Military and Reconstruction, 1862-1877 (Margaret M. Storey). 43. The Military, Civil Disorder, and Natural Disasters, 1877-2007 (Charles A. Byler, Jr.). 44. Coastal Defenses (Dale E. Floyd). 45. Air Defense (Edward B. Westermann). 46. Military Intelligence (David F. Trask). 47. Military Education and Training (Jennifer L. Speelman). 48. U.S. Military Chaplains (John W. Brinsfield, Tierian Cash, and Thomas Malek-Jones). 49. Military Communications (Jonathan Reed Winkler). 50. Military Order and Discipline (Benjamin R. Beede). 51. Covert Warfare and Special Operations Forces (Bob Seals). 52. U. S. War Planning (Donald Chisholm). 53. Military Justice (Mark Weitz). 54. Photography and the U.S. Military (Frank J. Wetta). 55. Music in the Military (Edward H. McKinley). Part VI: The Military, American Society and Culture. 56. The American Way of War (Antulio J. Echevarria II). 57. Civil-Military Relations (Charles A. Stevenson). 58. Women in the American Military (D'Ann Campbell). 59. Minorities in the Military (Thomas A. Bruscino, Jr.). 60. Medals and Decorations (David T. Zabecki). 61. The Military, the Cinema, and Television (Joseph G. Dawson III). 62. The Military, the News Media, and Censorship (Edward L. Walraven). 63. The Military-Industrial Complex (Benjamin Franklin Cooling). 64. The Military, War, and Memory (G. Kurt Piehler). 65. American Military Ethics (Thomas B. Grassey). 66. The Military and Sports (Wanda Ellen Wakefield). 67. American Veterans Movements (William Pencak). 68. Care for the Military Dead (Constance Potter and John Deeben).